Carry your bike everywhere ! 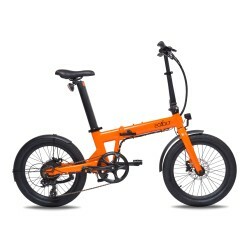 The same principle of folding bike is of course that it is foldable and therefore easy to carry. Thus, you will be able to borrow a variety of means of transport ; transit transport more classics such as the car or camping-car, while having your bike ready without as much bulky. This will allow you to integrate cycling in your daily commute. As soon as the traffic becomes dense on the outskirts of cities, you park, get out the bike out of the trunk and save time and peace of mind on the rest of your trip. The store at home will also be a true child's play ! And, if you do not have safe places to park your bike in the day, the bike folds up and fits in a corner of the office.